Before the release of Ben Affleck’s surefire hit Argo, the film garnered a ton of positive press from movie people and really pissed-off chatter from, specifically, grumpy Canadians. The film is a topical period piece in the same way that Charlie Wilson’s War used a story from the 1980s to say something current about the war in Afghanistan. Only Argo does it better. It’s a wonder that the story of the CIA’s eccentric rescue of 6 would-be hostages who escaped from the US Embassy in Iran in 1979 wasn’t made into a movie the moment President Clinton de-classified it in 1997. It’s got everything- high stakes, intrigue, action, movie-making inside baseball, and even a little dash of romance. But thank god it never got made, because right now in 2012 with the US presidential election a week away, tensions with Iran the highest they’ve been in decades, and Ben Affleck at the top of his filmmaking game, now was the only time for Argo. The reason the Canadians were pissed is that word got around that the film *gasp* glorified the American contribution to the rescue and downplayed the involvement of the Canadian government and, more importantly, the heroic efforts of Canada’s ambassador to Iran, Ken Taylor. What was difficult to explain to the sort of person who would get up in arms about such a thing, was that even if the actual life-saving came down to Taylor’s decision to house “the houseguests” after both the Brits and the New Zealanders turned them away, the part of the story that makes for a good movie lies almost entirely with Tony Mendez, the CIA and the Hollywood types who helped set the whole crazy thing up (played delightfully in the movie by John Goodman and Alan Arkin with just the right amount of hilarity and gravity). It’s a storytelling issue, not a value judgement on who was the most heroic. But sort of like when the anti-Rowling sermonizers finally read Deathly Hallows and immediately stopped writing books about religious heresy in children’s literature, the din of my countrymen’s whining seems to be slowly dying as, one by one, folks put down their op ed pens for 2 hours and actually go see Argo. It’s a great film, just technically and emotionally superior to most stuff that hits the cineplex. But, beyond that, it’s entirely more respectful to the Canadians than reported. 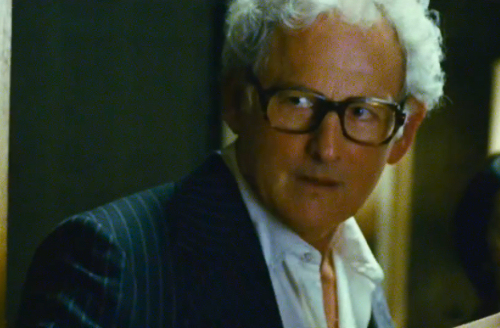 Ken Taylor is soft spoken, self sacrificing, and smartly rational as played by Victor Garber (a beloved Canadian and therefore a supremely smart casting choice). And while, yes, the film mainly focuses on the American perspective and addresses how the CIA humbly stepped back from the credit at the time (heaping it on the Canadians to avoid retribution), it doesn’t do so in the obnoxious we-are-the-only-superpower way it could have. Ben Affleck is an American icon, famous for patriotic hero movies like Armageddon and Pearl Harbor, but he’s also an incredibly thoughtful director (and all around smarter than we as a culture are bizarrely stubborn to admit) and thinking that he would ever make a film so simplistic as to make Americans the out-and-out heroes of anything involving Iran is really just insulting to him as a filmmaker (not to mention as an engaged and politically minded citizen of one of the world’s most controversial countries). Tony Mendez (played by Affleck in one of his best onscreen performances ever)- the CIA operative who came up with the plan to have the “houseguests” pose as a film crew, and flew into Tehran to bring them home himself- is the hero of Argo, and there are many other American characters whose strength and valour are immeasurably showcased in the film (including Goodman and Arkin’s characters as well as the 6 “houseguests” themselves), but it’s not a movie about how America is Beautiful and Iran is Horrible and Canada is a quirky sidekick to US supremacy. In fact, the terrifyingly visceral first act of the film plays out largely as a criticism of American foreign policy and the political antagonism that was directly causal in the hostage crisis. Sure, the real story gives more credit to Taylor for getting the ball rolling on exfiltration (Mendez is brought in principally to orchestrate the cover), but it also splits the “houseguests” up between the Taylor house and that of Canadian immigration officer John Sheardown, and adds the cooperation of the British, Swedish and New Zealand embassies in Tehran (a controversial detail thats exclusion does wonders for tone and urgency but is understandably not appreciated by the Brits, the Swiss and the Kiwis). What Affleck and screenwriter Chris Terrio have done with history is what all good storytellers do with history, use it to tell a story that’s more compelling than anything they could make up. And that, especially in film, usually means a little cleaning, a little focusing, the occasional mild alienation of sticklers. 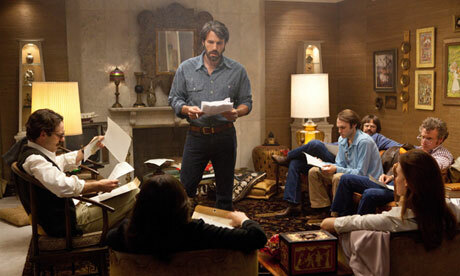 Argo is “based on a true story” and those words “based on” are some of the ones that make it as excellent a film as it is. 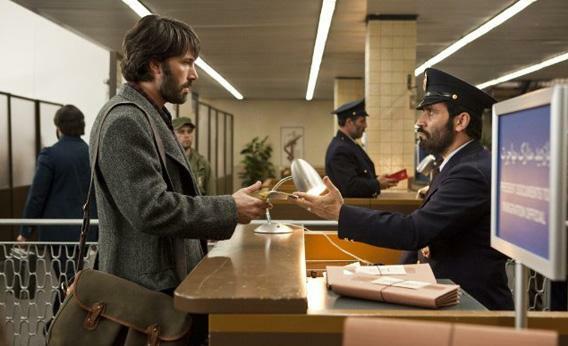 The other main words that makes Argo as excellent as it is are simply “Ben” and “Affleck”. There’s just no getting around how strong of a director he’s become. After being inexplicably shutout for The Town, Argo will likely be the film that gets Affleck his second Oscar (at 25 he won for Best Screenplay with Matt Damon; the rest of us are all underachievers). He’s the sort of director whose work needs to be admired after you leave the theatre because he tells a story so engrossingly that you don’t have time to gaze at his artistic shots, you’re too busy worrying about how his tale will continue to spin. His shots are beautiful and his sense of history is spot-on (this is true across the production, actually, from the work of the cinematographer to the costume designer and the set decorator who likely was the one to add details like the pre-WB logo on the water tower, the Hollywood sign in disrepair and the tacky perfection of the fake “Argo” costumes), but these are things you notice if you’re trying to make note so you can justify saying the direction is brilliant instead of just crediting the director with the close-to-perfect execution of a clearly directorial film. It being a de-classified true story, you already know that these people are going to make it out of Iran alive. You know it’s going to work. But I’ve still never had a film get my heart pounding the way Argo did. I’m an emotional movie-goer; I laugh, I cry, I occasionally yell at the screen (only when it’s not disruptive, I swear) but it’s pretty hard to literally quicken my pulse. And Argo did. I was so enthralled by the journey of the film that at its moment of resolution I literally burst into tears of relief. Not eyes-gradually-brimming kind of tears, uncontrollable, rolling, out-of-nowhere-then-suddenly-gone tears of cathartic joy after spending two hours on the edge of my seat. The film is paced impeccably and full of the sort of stakes-raising moments of conflict that only a director with a superb sense of nuance can slip in there without seeming emotionally manipulative. There’s just enough of the thriller-comedy-caper side to keep the film rollicking (there are times when it’s almost as if you’re watching Ocean’s Eleven, if Ocean’s Eleven had stakes beyond “will Yen make the jump without hitting the floor sensor?”) and the rest is high drama and ensemble character study at its best. 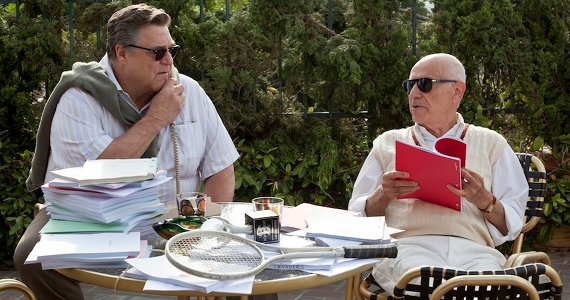 Huge TV talents like Bryan Cranston, Chris Messina and Kyle Chandler fill the small roles at the CIA and White House (more historical figures like President Carter are woven in using real video footage) while the complicated roles of the “houseguests” are filled by less familiar faces (and Tate Donovan, always welcome) who are understated and tangibly terrified- all brilliant. The best of them is probably Scoot McNairy whose Joe Stafford is the most confrontational and skeptical but ultimately ends up having to be the one to sell Mendez’s loopy cover when it matters most. Likely overlooked by most audiences, my favourite character in the film comes from Sheila Vand who plays Sahar, the Taylors’ Iranian housekeeper who stands up to an inquiring guard. In a film full of brave people, Sahar’s defiance when threatened with not only persecution but actual damnation in her only spotlighting scene is a spine-of-steel moment that shows off the country-less quality of goodness in a way that more perfectly sums up the film’s attitude towards humanity than anything else. Argo is filled with moments like that- tiny things that achingly reveal the humanity and terrifying reality behind a story that feels almost too entertaining at times. It really is a brilliant piece of filmmaking on all counts and pays tribute to both past and present so tangibly that the minutiae some history buffs have been barking at seems- and rightly so- monumentally insignificant.